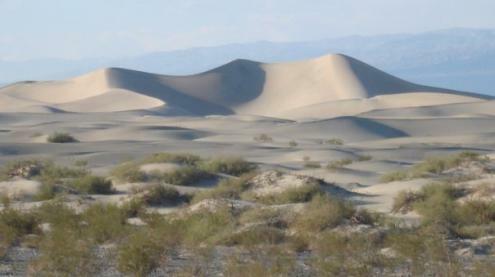 Death Valley has probably been the highlight of our trip so far in terms of natural beauty. The place is incredible. We would never have thought that a place with a name like Death Valley would have such varied terrain, so much life and such colour and beauty. From sand dunes to colourful canyons to lone cactus plants, to flat salt plains. We have never seen any place like it before. It was really incredible. We arrived after dark so it was such a lovely surprise to wake up in such a beautiful place. We went for an early morning swim, followed by a 2-hour horse trail in the desert, followed by a delicious American-style breakfast at a typical cowboy style saloon at Furnace Creek. Another highlight was our hike in the Gold Canyon to Zabriski Point, which gave us a 360 degree eagle's view of the surrounding mountains. It was just the two of us - there were no other people and the silence in that landscape almost hurt your ears. On our way out of Death Valley, we stopped at the Sand Dunes, which was a striking sight as the sun was setting over the desert. An amazing place to visit and we are so glad we had the privilege to see it.